Kick off the merry season on the right note at the Irish Village, which will be hosting a tree lighting event on Monday 3 December. This family-friendly evening will feature two choirs and Christmas treats for you to enjoy, such as mulled grape and freshly baked mince pies. Follow the scent of sugar and spice to JW Marriott Marquis, where you’ll find a giant gingerbread house at the entrance to La Farine Cafe & Bakery. You’ll discover the hotel’s fabulous festive market there too, brimming with gift hampers and Christmas sweets, plus indulgent hot chocolate, fondue and piping-hot waffles. From 4 to 21 December, the Versailles Gardens in front of Habtoor Palace will transform into a Festive Garden. The season begins with an glittering event on 4 December, complete with a choir, tree lighting ceremony, snowfalls and carol singing. 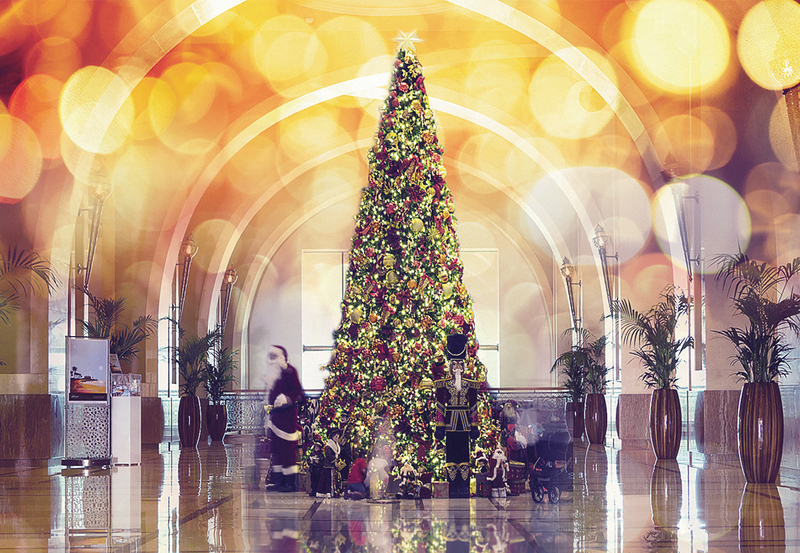 Fairmont The Palm’s annual Christmas tree lighting ceremony is one of the biggest and brightest in Dubai. This year, the event will be hosted by radio personality Big Rossi, and will include carol singing, festive treats, gingerbread making for the kids, and mulled grape, hot chocolate and eggnog for the adults in Mashrabiya Lounge. Big Bad Bob (Rossi’s dad) will be reprising his role as Santa this year, popping up for events and photo opportunities in the lead up to Christmas Day. Adding celebrity flair to the festivities, Kris Fade from Virgin Radio Dubai will be down at Wafi for the mall’s tree lighting ceremony, along with a children’s choir from the Dubai British School Jumeirah Park. Visitors to Wafi will also have the chance to meet Santa in his grotto and play in the snow park. Gather in the lobby of Address Dubai Marina for the hotel’s glam tree lighting event on 6 December, complete with a choir singing festive melodies. Or, take your little ones along on Saturday 15 December to join a Gingerbread House Building session, for Dhs135 per child. The Waldorf Astoria Dubai Palm Jumeirah will kick off festivities with its official lighting of the Christmas tree in the grand lobby on 8 December. This family-friendly afternoon will include Christmas treats, festive cocktails for the adults, and live music from resident carolers. Throughout the month, enjoy a Festive Afternoon Tea at Peacock Alley, daily from 2.30pm to 6pm, Dhs178. JA Hotels are bringing the festive flair to their UAE collection with a raft of tree lighting events on 13 December. Gather on the lawn at JA Hatta Fort Hotel from 7pm, in the Palmito Garden of JA The Resort – Jebel Ali Beach Resort from 6pm to 8pm; and in the atrium of JA Ocean View Hotel in JBR from 6pm to 7pm. The Els Club is bringing the Christmas spirit to Dubai Sports City, starting with a tree lighting ceremony on 13 December. The following day, the Atrium will play host to a family fun day, with face painting, games, and a chance to post a letter to Santa to receive a gift. The celebrations continue on the big day: order a takeaway turkey with all the trimmings; enjoy Christmas brunch at Big Easy Bar & Grill; or try the family roast at 261 restaurant.